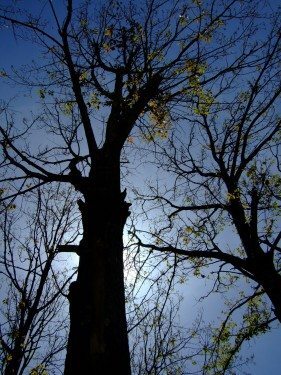 Our Road Trip to Kanvashram and Pauri - Ghumakkar - Inspiring travel experiences. During 2009 Dewali long weekend, we went to Kanvashram and Pauri. A visit to Lansdowne in October 2002 was my first encounter with the Uttaranchal hills as well as Pauri Garhwal. 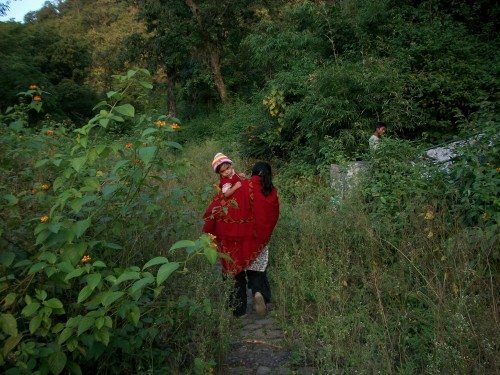 Since then, I have visited Pauri and Khirshu around 6/7 times, covering all seasons except summer, despite my wife’s vehement opposition against the idea of visiting the same place again and again. The gateway of Pauri-Garhwal is Kotdwara- a small town in the Shivalik foothills. Till now I have always travelled from Delhi to Kotdwara in Mussouri Express. Tickets are almost always available in this train. The journey itself is quite interesting. Leaving Old Delhi railway station at 10 pm, the train reaches Najibabad junction at mid night. “Sultana was a member of the Bhantu criminal tribe. With the rights and wrongs of classing a tribe as ‘criminal’ and confining it within the four walls of the Najibabad Fort I am not concerned..”- says Sir James Edward Corbett in his fascinating story “Sultana: India’s Robin Hood”. Here the train engages in a seemingly ever lasting act of disintegrating the coaches of Haridwar, Rishikesh and Dehradun from those of Kotdwara and keeps going back and forth while changing tracks. Most of the passengers usually desert the train at Najibabad. If travelling in a non-ac coach, you will be left exposed to an attack of mosquito herds and will desperately wait for the time when the train completes the prolonged back and forth movement. Near the onset of dawn the train finally begins its journey to Kotdwara crossing a stretch of Rajaji National park on the way. As you near Kotdwara, you would see the first glimpses of Shivalik ranges. Kotdwara railway station, with Shivalik hills in the background, has a number of large old trees on its platform and a unique vintage look. After having a cup of tea outside the station, I typically board in a white colored Marshall, which remains parked just outside the station looking for passengers of Pauri, driven by a cheerful and fun loving gentleman in his mid fifties, who, while driving, keeps discussing with the passengers various pressing issues starting from politics or the evils of modern society to the problems of rash driving or the degree of snowfall at Pauri last winter, and never uses any slang. He would finish at least half a dozen bidis on the way and one thing irks him: if you, while seating beside him, fall asleep. This time, I thought of taking my first lesson in highway and also hill driving. We wanted to start sharp at 5 am to avoid heavy traffic throughout the Delhi-Meerut stretch. As it happens, I had a late night meeting on the day before and slept at around 1 am. Thus, we got up at 6:45 am which was quite late. But, we managed to pull everything together and start at 7:30 am and took a short-cut from Indirapuram to reach Mohan Nagar in no time. There was light traffic on the Mohan Nagar-Meerut stretch and the surface was good with a divider all the way. At places like Modinagar and Muradnagar we encountered traffic jams. I internalized an advice from Nandan in his Delhi-Patna road review post- ‘avoid the “fix the rest of the world” attitude’. It really helped here. At Meerut, I left NH 58 and climbed the flyover to enter Meerut city and followed a Delhi-Kotdwar UA(Uttaranchal) roadways bus hoping that it will help me to navigate through Meerut city and take me to Pauri road. It worked. We left Meerut city at 10 am. After Meerut, the traffic volume reduced drastically, surface quality was superb and absence of divider in this stretch was not a problem because the road was pretty wide. The view of acres of cultivated land and mango gardens on both sides was extremely refreshing. The authorities have done a good job of planting trees on both sides of the highway. Before Bijnore we crossed the Ganges. Few kilometers before you encounter Ganges, the road turns narrower and has several sharp turns. One must be extremely careful while driving through this stretch. 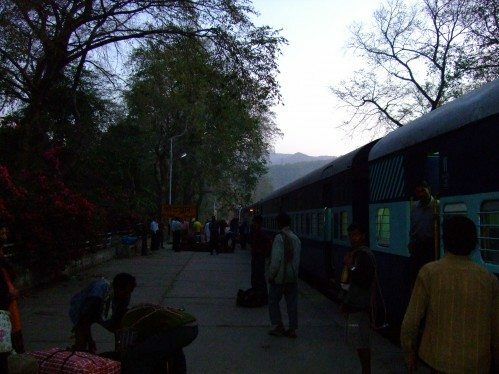 In December 2006, I was going to Pauri with my colleague Ravi Kiran. Here, our UA roadways bus collided with a truck coming from the opposite side. We escaped with minor injuries and hence could continue that journey. Unlike the Delhi-Haridwar highway, there are very few roadside Dhaba’s on this road. We carried breakfast (dry parantha) and ate the same as I was driving and thus saved time. Despite some provocation from my wife who was comfortably placed in the back seat with our 2.5 years old son, I did not go beyond 90 kmph. While entering Najibabad, I was not lucky enough to be lead by the friendly UA roadways bus again. Hence I ended up entering a road inside the town where a flyover was under construction and as a result of that, a portion of the road was terribly narrow, causing traffic jam. While returning, I was able to identify the Najibabad bypass and could avoid this stretch. Shortly after crossing Najibabad, much to our delight, we saw forests (Rajaji National Park) on both sides of the road. The road was narrower compared to the Bijnore-Najibabad stretch but the surface was good. I restricted myself to less than 60 kmph here. We soon got the first glimpses of the Shivalik range rising behind the forests. It came closer and closer as we reached Kotdwara. From Kotdwara, I turned left for Kanvashram and took the Haridwar road. The road now turned even narrower. There were two places where bridges were being constructed and as a result of that, we had to cross dry river beads. Shortly after crossing the second river bead, I took a right turn and reached the Kanvasharam GMVN Tourist Rest House with in around ten minutes. 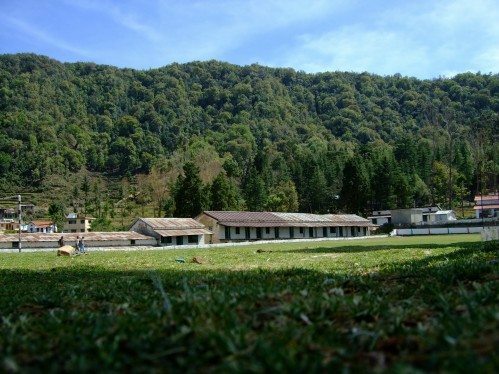 Kanvashram GMVN complex is sort of a watershed between the small localities in the plane and the forested(Rajaji National Park) hills that stand firm in its backdrop. The tourist rest house has around three double bed rooms and one dormitory and can house around 17 persons. Few more new rooms were going to be operational shortly. The kitchen and dinning rooms are around 100 yards away. When we reached, only the Sweeper bhai was available there and he offered to feed us lunch before leaving for his village. There was a breakdown in the water pumps and hence our sole friend supplied few buckets of water which was enough for us. The scenery and serenity of the surrounding was very appealing and as Srabani started chasing Om with a glass of milk, I relaxed on the floor of the balcony, enjoyed the sun and stole a quick nap. After lunch, the son of the kitchen caretaker, Sonu along his pet Sheru (a gigantic hill dog), showed up and took order for dinner and offered to show us the surroundings. At around 5 pm, he guided us to the Kanva Muni’s temple. We met a Sadhujee there who told that a few days ago he saw a large leopard relaxing on the branch of a tree under which we were then standing. At night I heard from the Caretaker that leopards are daily visitors of the surroundings and occasionally the elder cousin pays a visit. Sonu then took us to another temple where people come to collect herbal medicines. 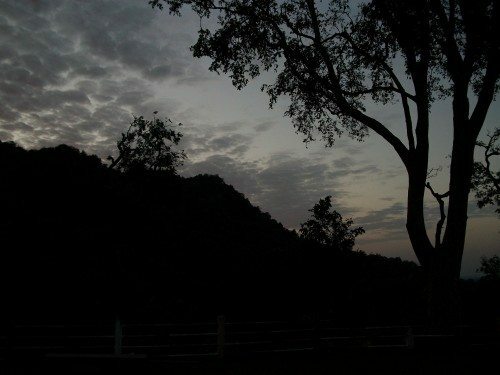 The narrow track to the temple was surrounded by dense bushes and it was after dusk and there were no one else around. At around 7 pm the caretaker showed up and made tea for us. Then he took us to the adjacent forest office complex to show deer herds which are attracted by the fodder offered by the officials. Sonu brought us the dinner which was very well cooked. He offered to take us to some other places to the jungle next morning:there are many opportunities of light trekking here. But, I kept it for the next visit. Sheru was barking continuously at night, probably noticing a leopard or the elder cousin? Next to next day, at Pauri, I read in Dasinik Jagaran that a man eating leopard was shot in a village near Kotdwara. We started at 7 am in the morning after having a cup of tea and took fuel at Kotdwara. With certain amount of nervousness and yet a lot of excitement I started climbing the hills and shortly realized that there is nothing to be afraid of provided I do not rush and maintain my side. 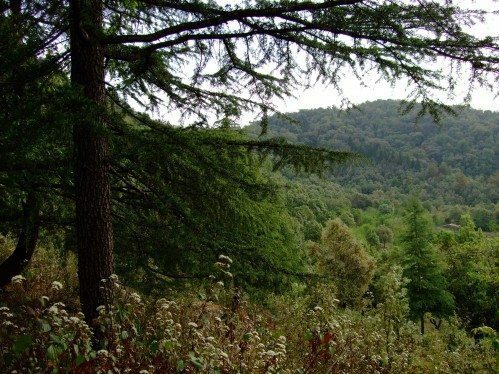 However, the pleasure of gazing at the hills and forests has to be compromised. From Kotdwara the road follows a continuous ascent till Gumkhal. At Gumkhal, we got the first glimpses of the snow clad Himalayan range with Choukhamba standing stout and taking the center-stage. We stopped the car and enjoyed the panaromic view for some time. Post Gumkhal, there is a continuous descent till the valley of Satafuli. From Satafuli, there are two routes to reach Pauri: the conventional and possibly the shorter one via Jawalpa Devi temple and the less travelled one via Banlekh, ADWANI AND Kangshkhet. The former is now being widened and best avoided. 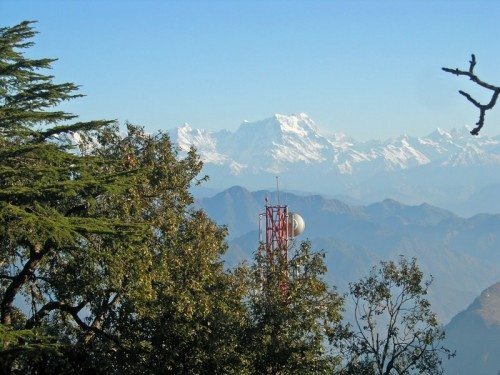 Unlike the former, the latter offers pristine natural beauty further dignified by the view of both Garhwal and Kumaon Himalayan ranges. The surface quality is not bad either. 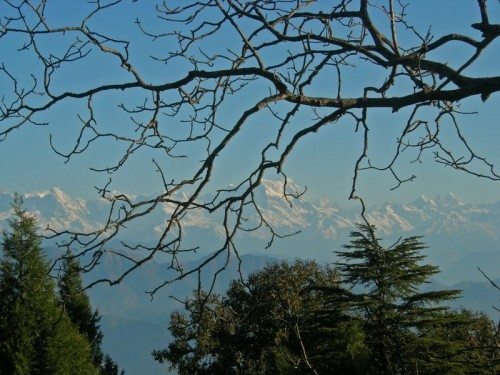 Post Banlekh, there is abundance of Oak and Rohodendron trees in the surrounding hills and in one turn you can see Kedarnath, Gangotri and Choukhamba in the north-west and on the next turn you can see Nanda Devi, Trishul, Hathi in the north east horizon. This is certainly one of the best mountain roads I have ever travelled. We wanted to stay at Khirshu and were convinced that rooms would be available; at least GMVNL room booking portal indicated so. However, on reaching Khirshu we found that an MLA and his associates have taken possession of the vacant rooms at GMVN tourist rest house. The private hotel was also occupied and the choukidar of the forest rest house refused entry without a permission from DFO, Pauri. 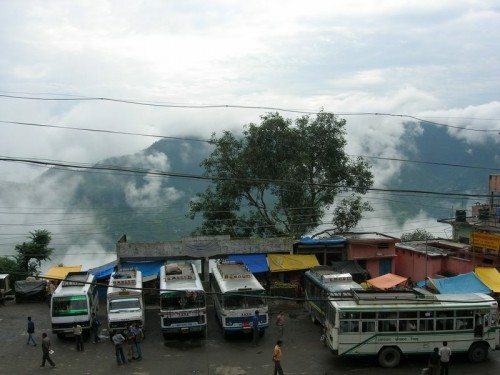 Hungry and tired, I made a call to Pauri GMVN and much to our relief the Manager assured that he will give me a room. After taking a short break, we left for Pauri and checked in to GMVN TRH. As Srabani started wrestling with Om, reluctant to have bath and eat his mundane baby food, I went to the market and got packed our lunch; we were too late and lunch time at GMVN canteen was over. After lunch, we settled on the terrace and scanned the horizon in the hope of getting a view of Himalayan range which was hidden behind cloud. We remained there till around 9 pm ignoring the chilling wind from the north. Pauri, at the attitude of around 7000 feets, was made an administrative center by the British as part of their colonial expansion. Now it is the district head quarter of the Pauri Garhwal district. Apart from GMVNL tourist rest house, there are few hotels here offering basic facilities. Apart from approaching from Kotdwara, one can reach Pauri via Rishikesh and Deoprayag. The Pauri-Deoprayag stretch offers an encchanting view of the Ganges. In the morning we got a panoramic view of the Himalayas from the terrace and after having breakfast in the market we went to the Kandoliya temple and spent few hours at the Kankaleshwer temple at the hilltop. The latter is an ancient temple. Mythology says that Yam raja turned into a skeleton (Kankal) here as a result of his several centuries long sadhana for lord Shiva. Unmatched panoramic view of snow clad Himalays, cool breeze, notes of jungle birds and silence: that’s all this hill top marvel offers. Now I would deviate slightly and try to explain one thing. 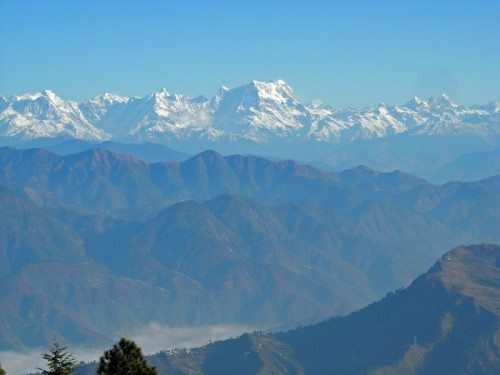 One of the motivations behind going to Uttaranchal hills for many of us is the prospect of viewing the snow clad Himalayas. The passion is centuries old. However, many a times, I have come back from the hills without getting a view of the ‘Himachal’. To Srabani, this implies an unsuccessful visit. Not so extreme to me; but after a few successes and failures I have sort of theorized something that I myself use while planning trips and advice others against queries such as “Shall we be able to see the peaks during this time?”. I thought of sharing the same with fellow Ghumakkars. If you visit Kumaon/Garhwal after Holi, you will notice instances of fire and smog in the hills. Either people put fire to clean the cultivated lands/forests or due to excessive heat fire is caught in the jungle. All these results in a haze. Now consider the places like Munsiyari/Kedarnath/Gangotri and Badrinath(call them Category B). These places are closer to the snow ranges. I believe that the haze factor can play show spoiler here also, but not to the large extent as it does to the distant places. places of category B are accessible). 2) July/August – best avoided. 2) Rest of the Year: Category B. Since it is a probability game, spending few more days, if possible, increases chances of success. On the way back to GMVN we bought some crackers. After sunset, Pauri was garlanded with diya’s and looked glorious. Next morning we started at 7 am and took the Jawalpa Devi route in order to shorten the journey time. Except for a stretch of 15-20 km’s, in which I thought both my car and my driving skill were put into a rigorous stress testing session, the journey was smooth. We could reach Kotdwara in three hours. It took us another fours hours to reach Indirapuram. Rahul is from West Bengal. He was exposed to the fun of travel by his parents. He loves nature and enjoys going to Himalayas. Beautiful pictures Rahul. The lush green article of yours is a perfect to start the day. Fantastic overview Rahul. Have been to the area a few times (primarily to Lansdawn) but never tried Kanvashram or even Pauri. Really liked your writing and as a result already started planning the next visit as well. Best wishes for your trip to Pauri. Last year I have been to Lansdowne from Dehradun via Haridwar but not able to visit Kanvashram. Thanks for sharing your experience on the same. Pictures are awesome. 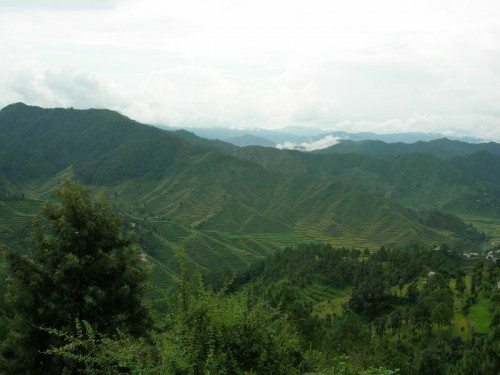 There are so many unexplored place in Uttrakhand (Dev Bhoomi) , Khirshu is one of the best hill stations in Uttrakhand. Last week I was in Yamnotri & Gangotri , some of the villages like Barkot , syannachatti, Nathala ,Jhala, Harsil etc are so beautiful. ## You are right, Mahesh Sir. Even if we consider Pauri Garhwal only; there are so many places to cover. One can enter Corbett National park through Kalagarh, around 50 km away from Kotdwara. Also, Sonanadi is another spot in Corbett that can be reached through Kotdwara. 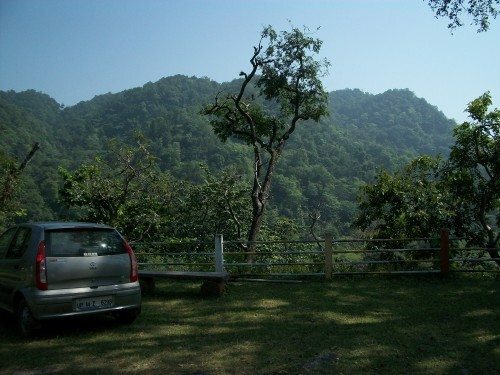 There are many such places in Corbett which can be accessed bia Kotdwara. 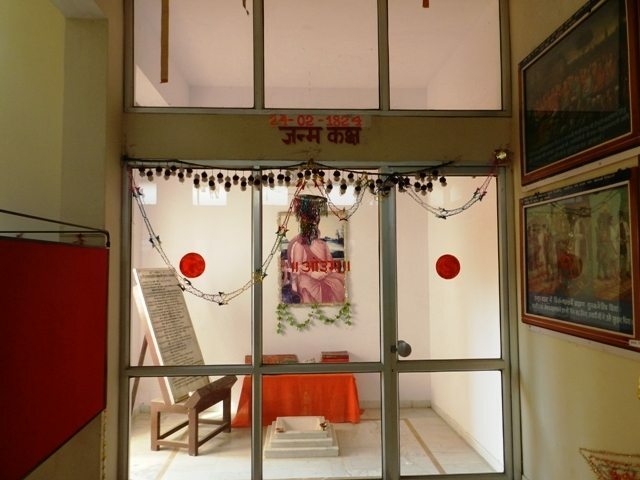 I think GMVN is the only option for accomation at Kanvashram. It is always advised to book in advance. I would try to visit again in Winter- an ideal place for picnic!! That’s cleared my thoughts. Thanks for cnotribtuing. Another unexplored destination. Thanks for the post Rahul. I am sure people who are looking for this kind of trip in future would certainly find this article not only interesting but also informative. FYI..I’ve spent 4 golden years of my life in Pauri from where I’ve done my engineering and had really good time in/around Pauri. Please elaborate “avoid the �fix the rest of the world� attitude�. BTW, I am also planning a similar trip to Pauri year end. Though I had no plan as such to visit Pauri, but the pictures that you’ve posted have aroused my desire to go and explore the beauty of this place. Surely, Pauri will be in my radar of places of interest for my future visits. Thanks indeed for the nice report. I didn’t know about Kanvasharm. Thanks for introducing me to the place. I guess, by spending time at Ghumakkar, at least my travel knowledge (and virtual travel) is growing with every new post. Very comprehensive note indeed. Keep it up. I stay in M. Vihar, Delhi. Want to purchase a plot of land to erect a cottage for my family around Kordwara, since it is under drivable limit from Delhi. Did you notice any nice cottages in the town? We will use it for occassional visits, may be 3/4 times a year for 7/10 days on every occassion. Dazzling, fascinating description. Will surely visit these places some day. I have visited Lohaghat twice.Intend going to Pithoragarh sometime this year. Your write up is simply beautiful and the snaps breathtaking. I am forever in love with the Himalayas and the ganges. Went to Uttarkashi and Gangotri in May2012. 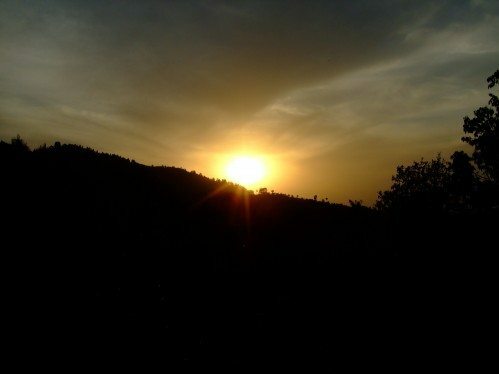 Will be going to Himachal in June 2012.Call from Dev Bhoomi again. Maharshi Dayānand Saraswati was born on 12 February 1824 at Tankara, Gujrat. He was an important Hindu religious leader of his time. He is well known as the founder of the Arya Samaj, a Hindu reform movement of the Vedic tradition. He was a profound scholar of the Vedic lore and Sanskrit language. He was the first to give the call for Swarajya as “India for Indians” in 1876, later taken up by Lokmanya Tilak.